ETA: It’s not Tuesday any more, but I’m posting this anyhow! 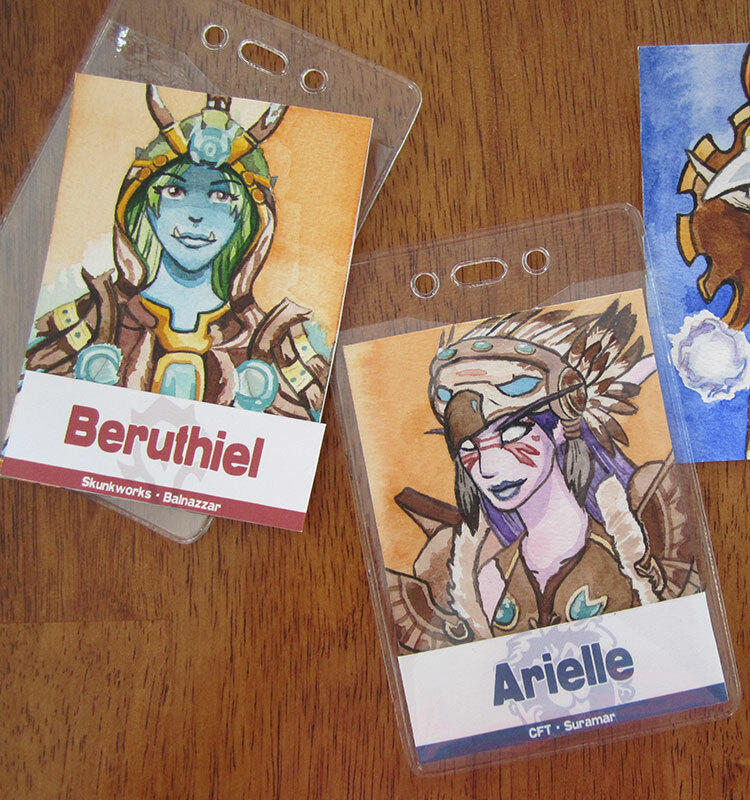 I’ve been doing more of my Blizzcon badges. Here is a sampling of the ones I’ve completed since I started doing them! 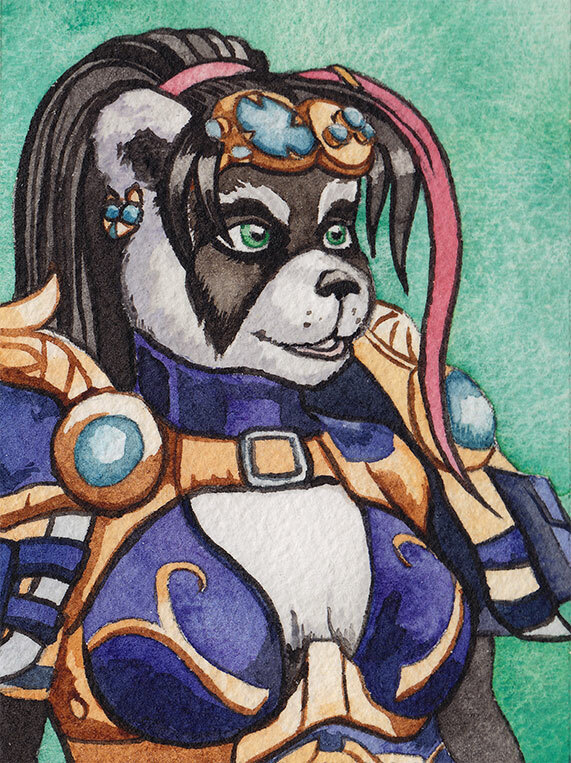 @Aerix88’s Pandaren hunter. 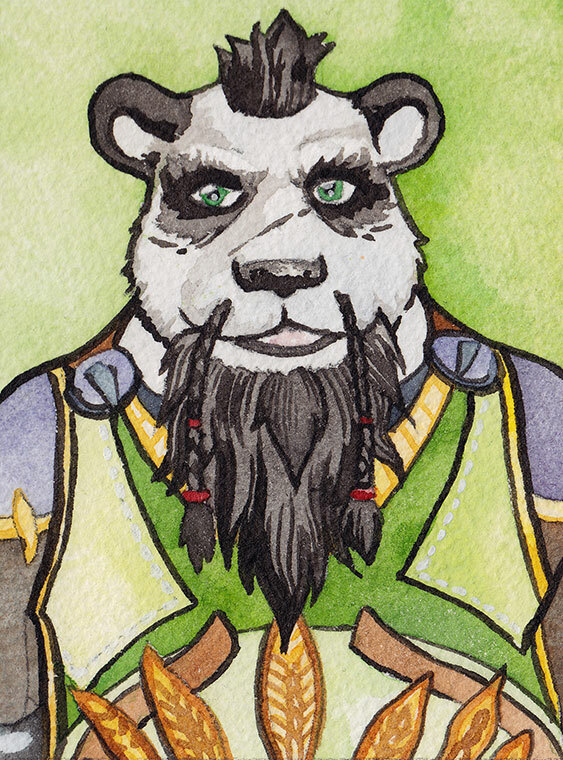 The first Pandaren I have done! For @TikariofET! 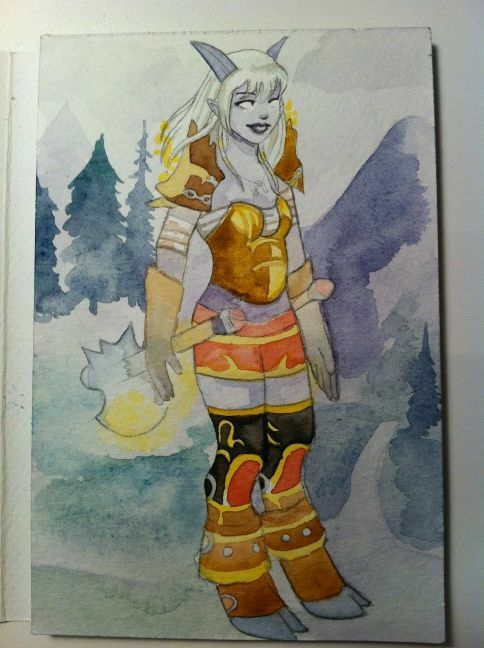 The first rogue I’ve done. Which is probably good because it seems I am popular with the druids! 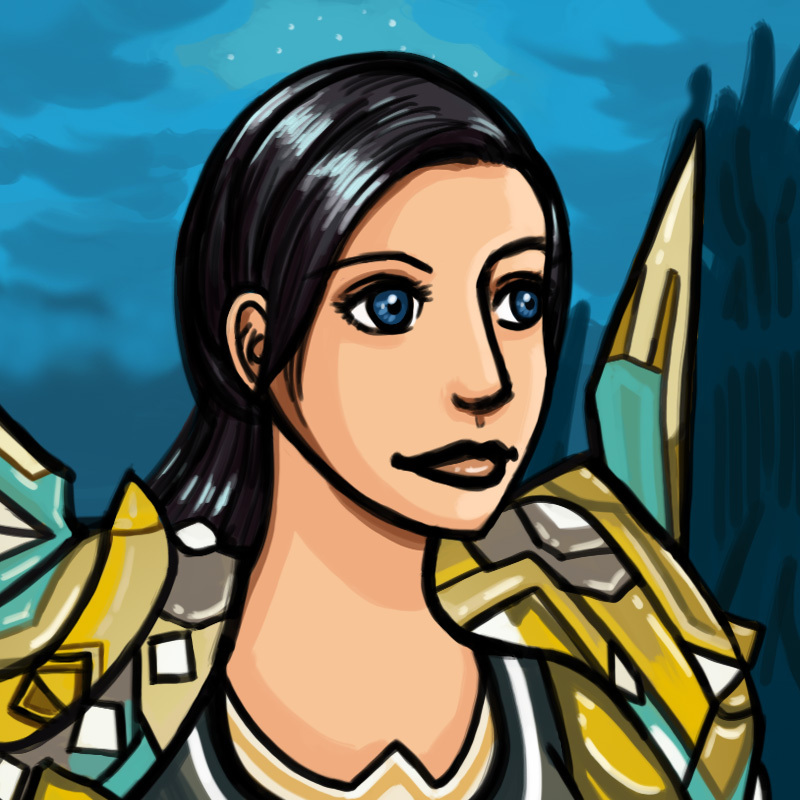 Kaleri of Power Word: What? 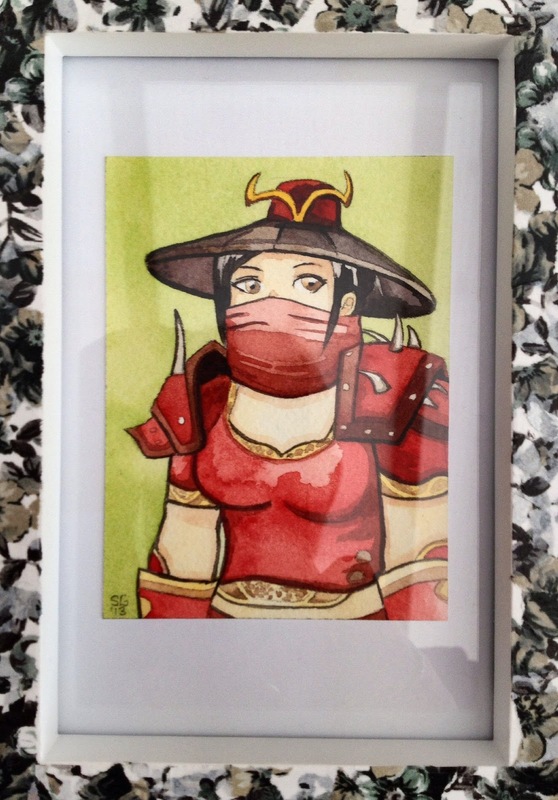 and @Kaleri_ on Twitter. One of my favourite bearbutts! 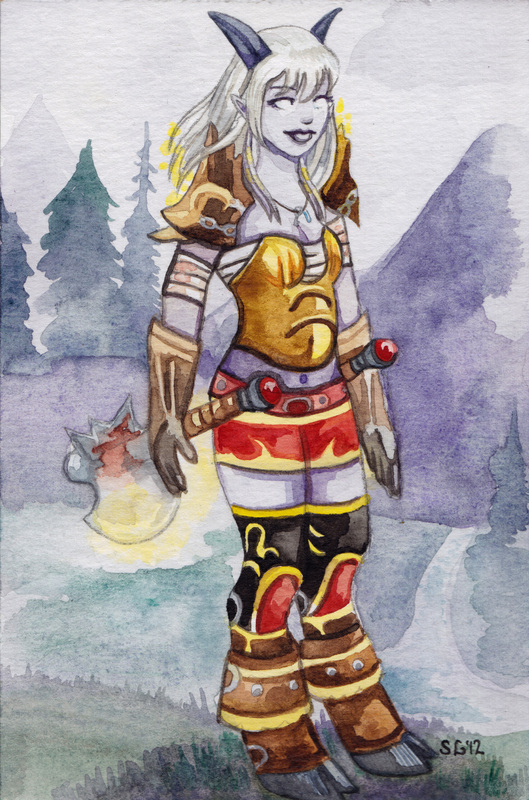 For @SunnierBear of Sunnier’s Art of War. I confess I especially enjoyed doing this one, probably because of the deep indigo colour of Sunnier’s armour and the HOT PINK of her hair. It’s nice to break out colours like that sometimes. I’ve never used that particular shade of pink almost straight from the tube before. I’ve been really happy with the response to these badges so far, and I just love painting them. As always, if you’re interested in commissioning one, you can fill out the form here. 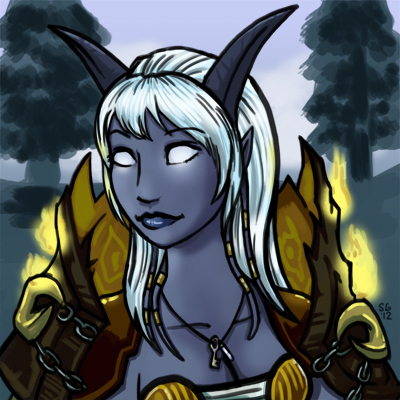 My commission status is in the right sidebar. I’ve got a bit of a line-up but it moves fairly steadily barring any exceptional circumstances. 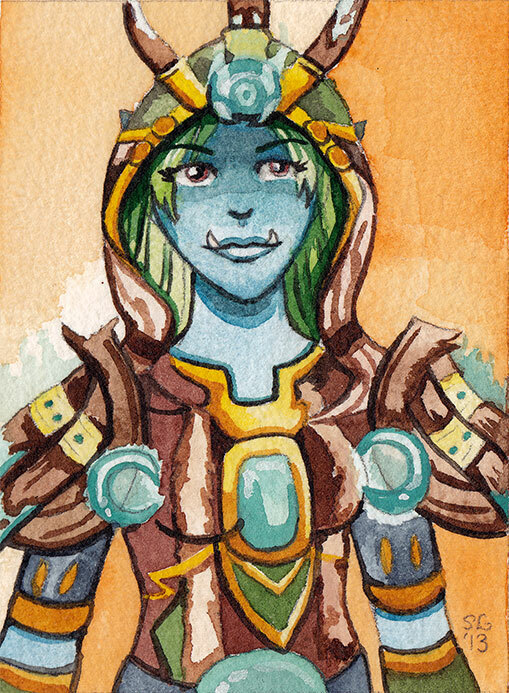 Firstly, thank you to everyone who wanted a Blizzcon badge on the basis of my other watercolour work and the quick badge of Millya I did. (I’ll be re-doing one for myself at some point, using actual references and a good transmog!) 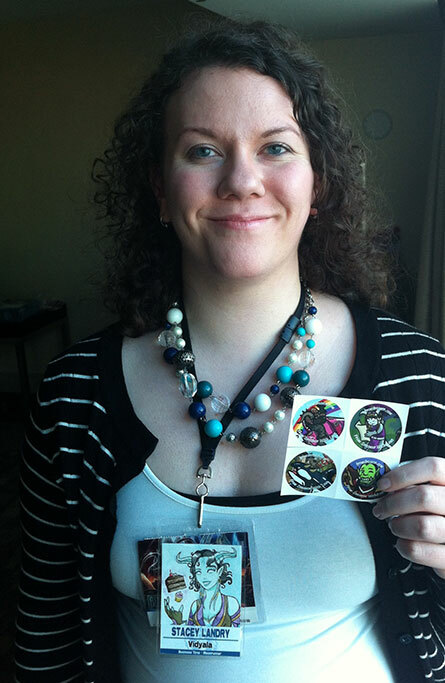 I am still working through my list of folks who signed up for a badge. If you’ve sent references, you’ll hear from me when I’m ready to get started on yours! 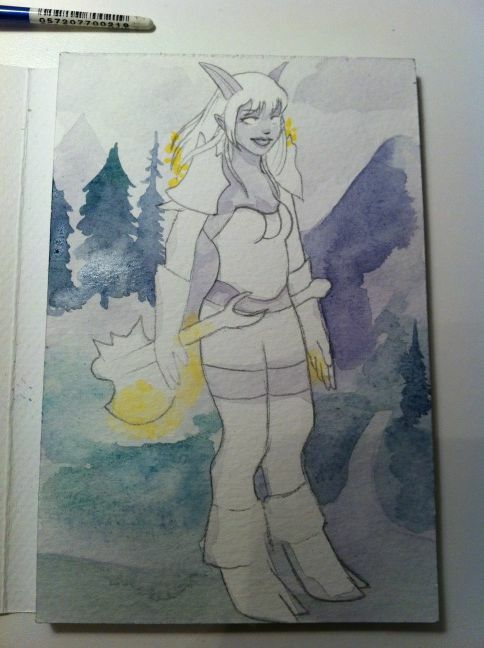 I’m really loving doing these so far, because it’s such a small painting it’s very fresh and immediate. You focus intensely on it for a few hours and then it’s done! Here are the first two I have done so far. 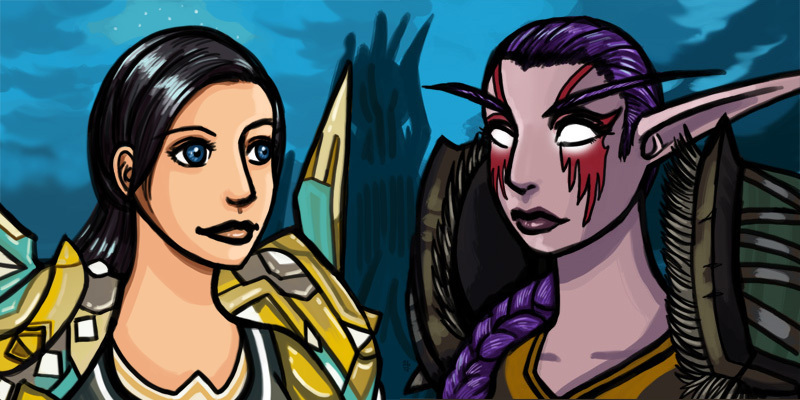 They both have orange backgrounds because they are both druids. 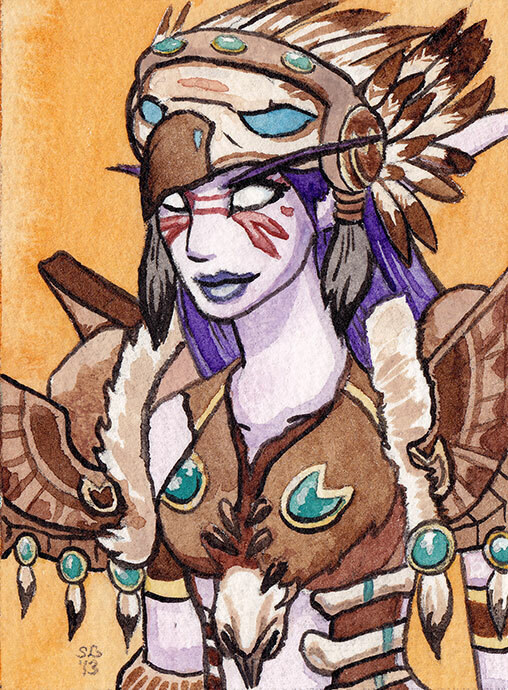 The next one I’m doing is a shaman! This first one was for my friend Beruthiel of Falling Leaves and Wings. 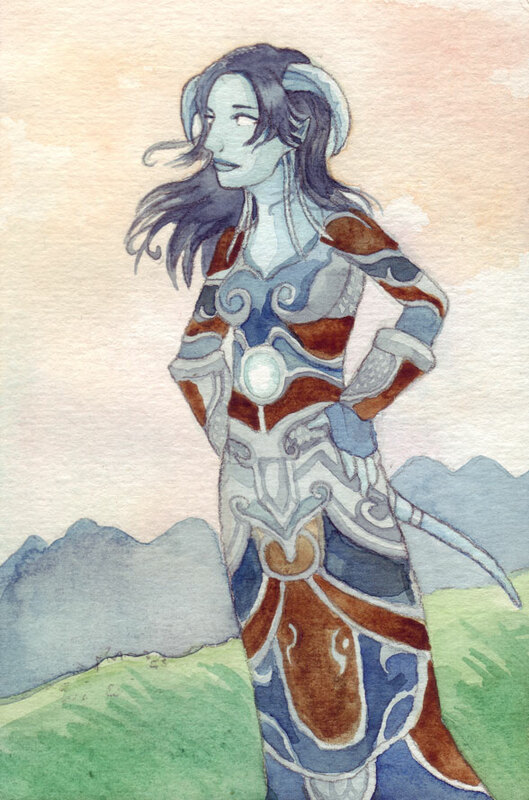 She has the extremely fancy (and elaborate) challenge mode druid armour. This next one was for Arielle of The Inconspicuous Bear, also known as @riftmaker on Twitter. 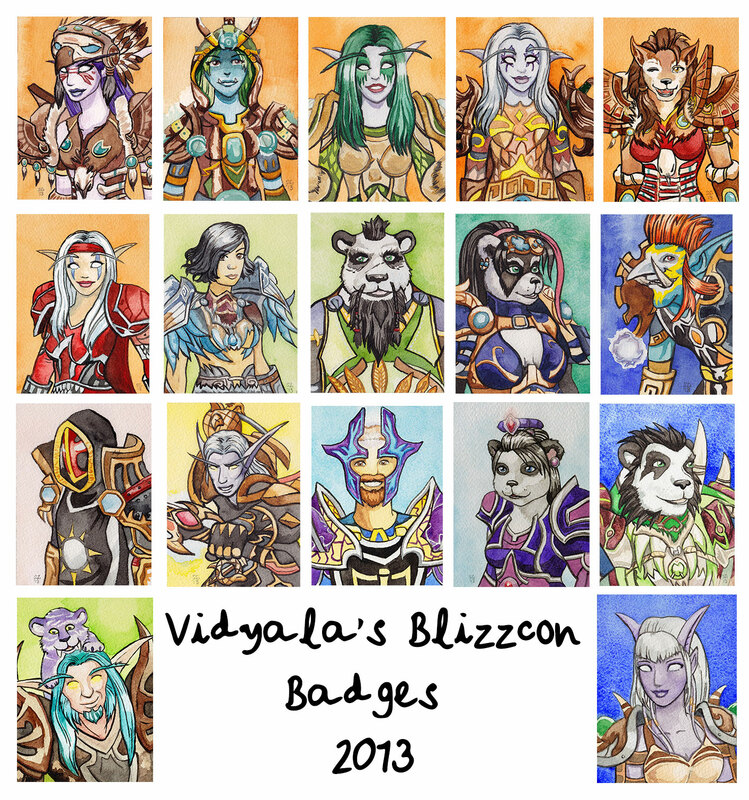 If you are interested in a badge, you can send me your info via my post here (please use the form! it has been making it really easy to keep track of everyone’s info and I like that). The line isn’t too long yet and I’m getting them done pretty quickly so far, so the wait time should be fairly decent. 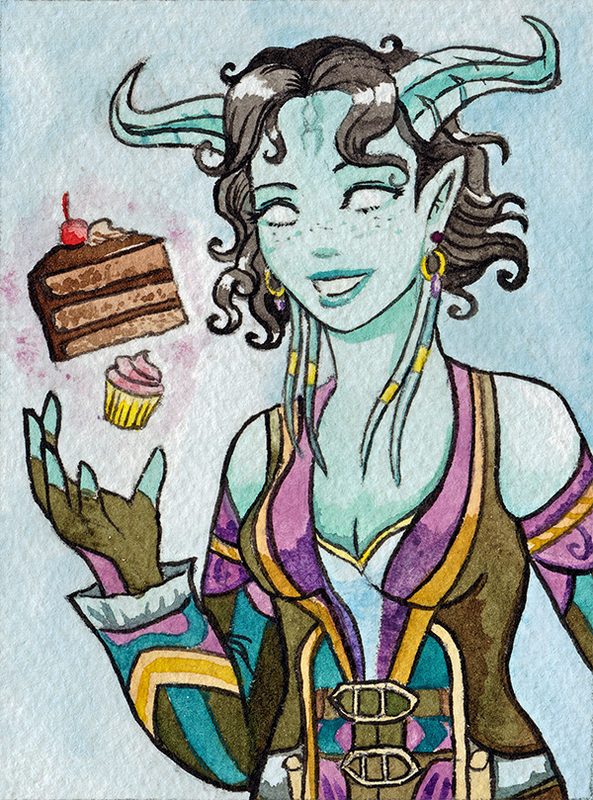 I may wait to mail them until I have enough to print out a bunch of name tags at a time, but before mailing you will receive a high-resolution scan of your painting. Thanks to everyone who has had positive things to say about the badges so far, I look forward to doing many more of them! This is a pair of avatars I did for the inestimable Ratters of Needs More Rage fame. It is Ratters’ character Kinnavieve (who I’m sure you all know) and his wife Julie’s character, Shianti. He asked me to make them so that they could go together and would be looking at each other, like so. 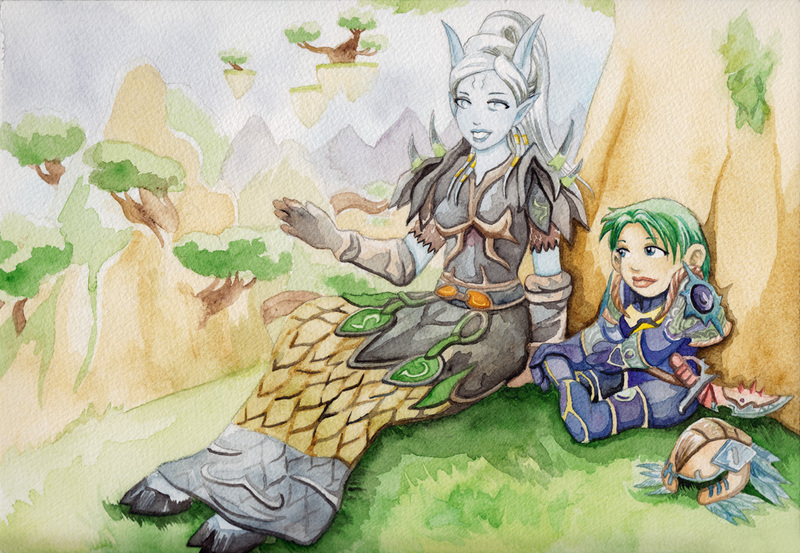 Accordingly I did the background in one long piece and then pasted it behind them. They do also exist as separate avatars, though. I was happy with them! More importantly, I think that Ratters and his wife were happy with them as well. 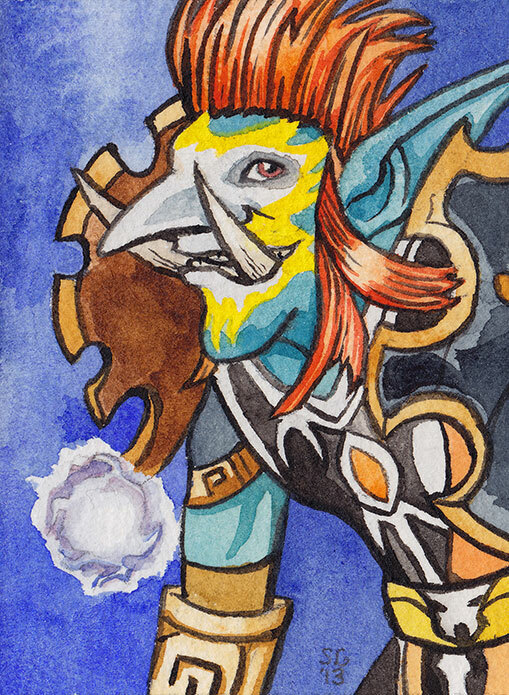 Ratters just recently hung up his (Warcraft) blogging hat, you should go and read his last few posts. Bring tissues though. These were done for Matty over at Sugar & Blood – she wanted two portraits! 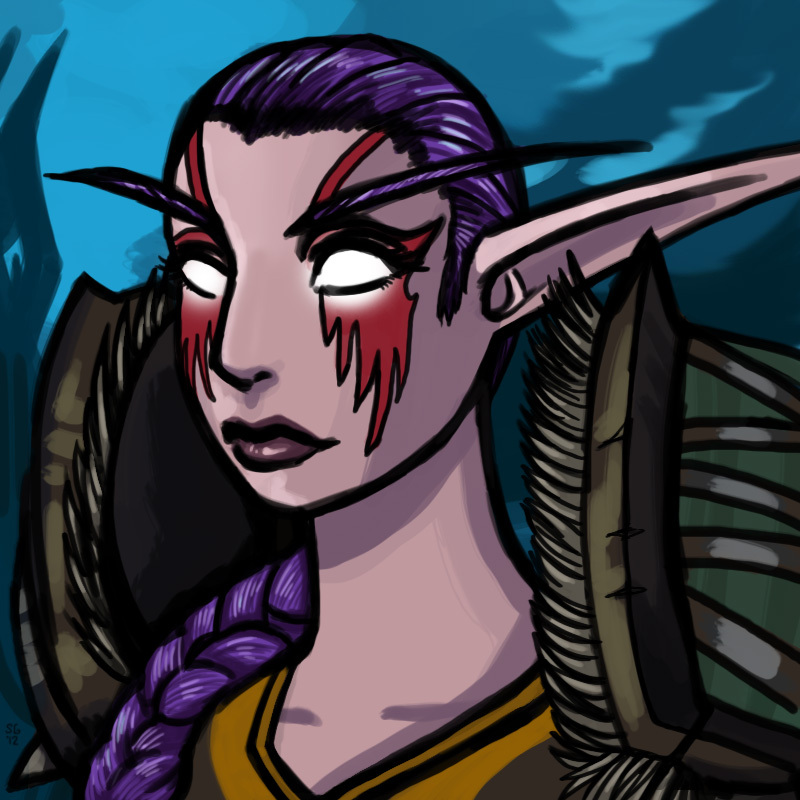 Here’s the first one, an avatar. Matty! 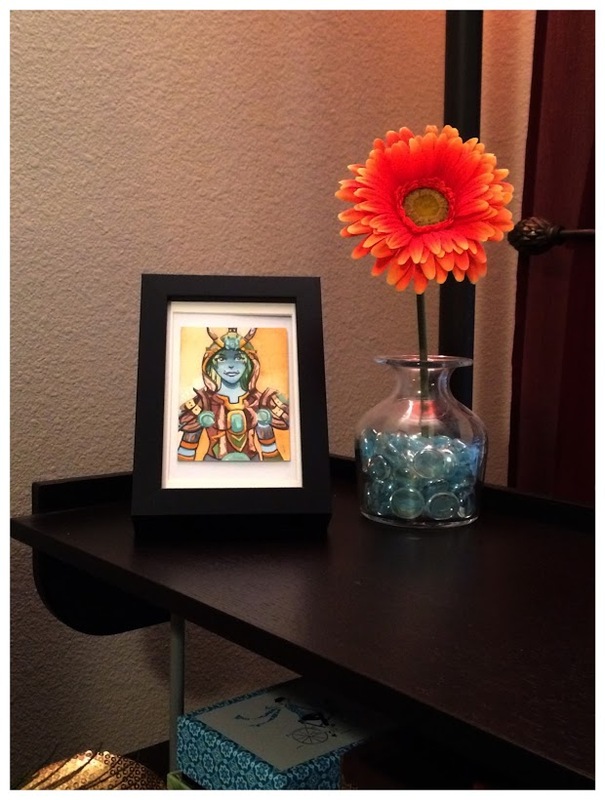 If you are a reader of her blog you may spot something I added after we’d discussed the image. The second one was a watercolour, and I was trying something a little different with it – I tweeted progress pics at fairly regular intervals. Just getting started! (I’d laid the first wash the night before and then let it dry). 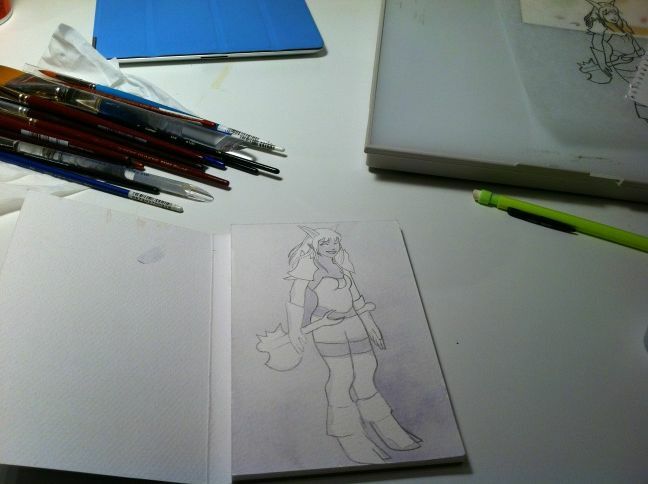 You can also see my lightbox, tracing paper, etc. Starting on the background and the lighter areas. 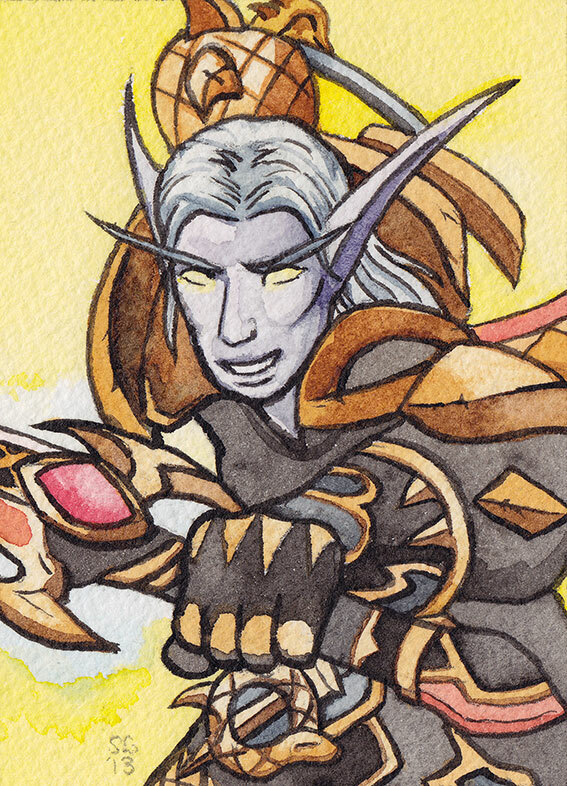 You can be a little bit sloppy with washes if they fall where shadows are going to be, but when it comes to colours like yellow you have to be pretty careful not to muddy them up. And that’s it! This was an actual scan of the painting, rather than a photo taken on my phone like the others. 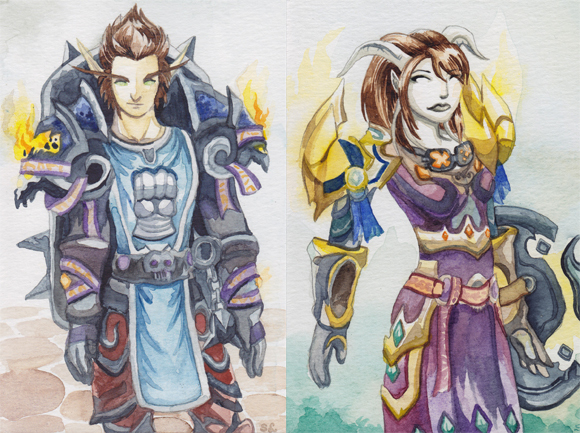 So those are two of the commissions I’ve recently finished! Matty also has them on her blog both here and here. I think she was happy with them, and that’s the most important thing for me! 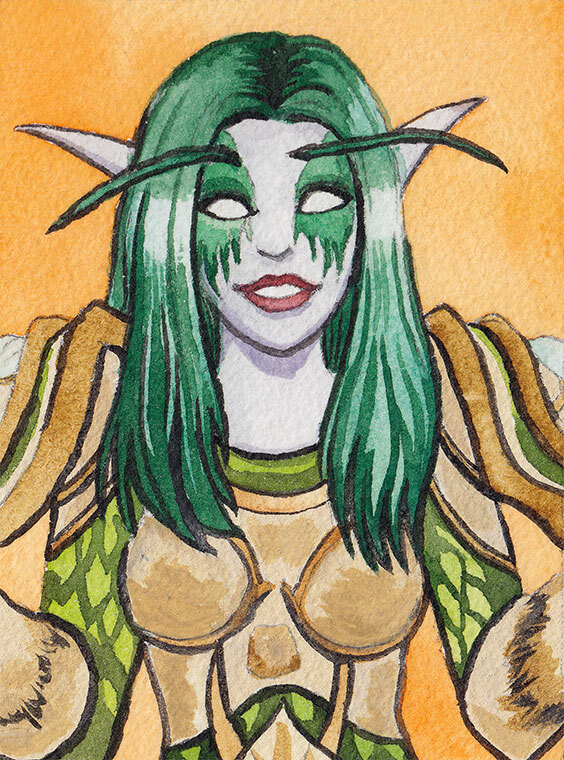 My commission dance card is pretty full at the moment, but please remember if you want to be added to the list, do e-mail me; it’s puggingpally AT gmail DOT com! It’s the easiest way for me to make sure you don’t get lost in the comments. You can see my commission entry for more info.